President George H.W. Bush has died, age 94. 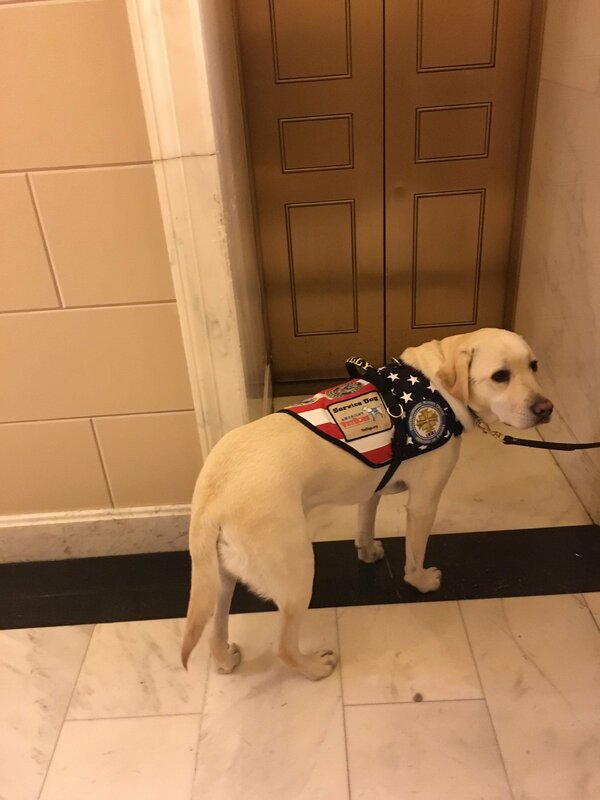 Apparently my Aunt met Sully the Service dog as he was getting off an elevator in DC. Damn Bob Dole looks like a corpse they dug up. Well, the man is 95, has had limited use of his arms since being wounded in WWII 73 years ago, has survived an abdominal aneurysm surgery and hip replacement in the last 15 years, and had a roller coaster ride in public service for 60+ years. His body is beyond high-mileage. I would trust that dog to land a plane on the Hudson. Government people are getting up there. CBS political correspondent with photos of the moment the Trumps arrive. He says the Clintons don’t acknowledge them but they do, particularly Hillary who nods a greeting to both while the Obamas (who are seated next to them so I guess they drew the short straw) shake hands. NBC news have the video. Yes, Bill’s face is a picture and yes, the Carters blank the Trumps entirely. The start will have you gritting your teeth, but the ending is surprisingly affecting. George breaking down for a second or two at the very end is particularly touching. And yes, half of it seem like digs at Trump, but let’s be real here; anything that mentions the need to be decent, honest and dedicated to the American people seems like a dig at Trump. Both Bushes were problematic leaders at best, but goddamn if I don't miss their brand of conservative as the opposition party we have to work against. Doubly so when the camera pans to Trump tapping his foot and crossing his arms petulantly. No, he's a war criminal. That family has left a trail of blood, death, and suffering over generations. That they genuinely feel the personal tragedy of a family member dying comfortably at 94 means nothing. No, he's a war criminal. The problem their brand of conservative opposition lead directly to what we have today. George Senior probably saw what was coming less than JR who was clearly setting the stage for what was to come. I think Newt Gingrich did more than Senior to pave the way. To fall back on terminology I am more comfortable with, I'd rather be opposed by lawful evil villains than chaotic evil ones. Both are evil in their policies, but one plays by norms and thinks about maintaining their reign long term while the other wants to literally burn everything down in a hissy fit. Closer watchers of politics know that the GOP has staffed its administration with chaotic evil assholes for years, relying on the moderation of leaders like Bush I and a compliant press to make sure that the only people who notice are the ones who care enough to pay attention or whose lives are directly impacted by their decisions. That all started to fall apart under Bush II, who was not smart enough to play the game, and has completed come crashing down under Trump. Table top morality systems aside its the same exact party. Its mean spirited, cruel, blood thirsty and greedy. Changing the head from a dimwitted pseudo cowboy to a dimwitted senile life style coach didnt change anything. It's what Martin Luther King referred to as the moderate preference for "a negative peace which is the absence of tension to a positive peace which is the presence of justice." Leaders like Bush I make it much easier to ignore the victims than an obvious monster like Trump. True, though I find the agenda of Cheney/Koch and their ilk to be substantially different in direction of evil than the Tea Party. While they created the monster, where it led has been as destructive to their power base in the end as it was as a tool against the Democrats. One could argue (and successfully, I feel) that the Tea Party was created for one conservative agenda and co-opted for another, especially in seeing how the various wings of the party operate (or, more pointedly, don't) now that they hold all branches. Though this is on a scale of pointing out that turquoise and green are similar but different shades of color. Neither are yellow. Casting shade on me for agreeing but having a slightly different take on that part of history I lived through, and did so while being a close watcher of politics, is sorta gross dude. And, again. I'm also talking about what we face in opposition. It is much easier to both find compromise or (more likely) to overcome an agenda with set policy goals that are specifically repugnant when your opponent is more likely to actually stay put and defend them as their legacy. Trump's brand of straight up lying and moving to a totally different tangent and not really caring about any legacy aside from his pocketbook makes working against him notoriously difficult. It also empowers his base to be for whatever he is for and against whatever he is against, rather than arguing points of policy. Or, rather, debating voters on the merits of the Iraq war and the economic disasters of Bush's tax and housing policies was how Bush lost power over time. But Trump doesn't care about any policy agenda in particular as his administration. Debating voters is on their feelings about Trump, not what he does, which is arguing against their emotions rather than his policies. Which is hard to oppose and sway the needle on. It's also a lot more dangerous. And, again, which is not to say Bush and his father weren't dangerous in their own rights. But the debates were on particulars and not personalities. I apologize for the offense, but I think the fact we lived through it is the problem. In the pre-social media age, it was incredibly easy to ignore the context of politics outside the snippets that you saw on the TV news or in the newspaper. If you dug deeper, you started to encounter the authors and activists who were screaming "Pay attention!" to the horrors being done to people in the name of conservative ideology. Millions suffered and died early (or were outright murdered in minority communities) to satiate conservative ideology, and the only places where you could learn this from pop culture were from the lyrics of hip hop albums. It's a lot harder to hide our eyes in the age of social media and camera phones. Man W. couldn't get away from Trump fast enough. He snuck Michelle Obama a piece of candy though. Bush the Greater also actually accomplished positive change along with all of the terrible things he also did/did nothing to prevent. That doesn't ameliorate or minimize the harms that also occurred, but those legislative accomplishments are still accomplishments. Bush the Lesser has maybe two, and Trump has zero so far to accompany all the horrors they unleashed from the hellmouth. You shouldn't applaud him, but you can't just ignore that either. His handling of the dissolution of the USSR and reformation of Germany can't really be faulted. I think most of Europe at that point didn't -want- a reunited Germany. The candy/cough drop thing between Bush and Michelle is strange. And seems to have pissed off Trump from the video. And has spent most of his life mad that he's not really welcome in. The whole thing is kind of pathetic from start to finish. Cause Trump is a kid and he didn't get a candy. What’s strange about sharing candy? Old people have candy and sometimes share it. Or do you mean Trump’s reaction to said sharing? Battlenet ID: MildC#11186 - If I'm in the game, send me an invite at anytime and I'll play. Its a cough drop and a running joke between bush jr and michelle. Due to protocol she almost always winds up sitting next to bush JR and apparently sharing cough drops between them is a running gag at this point. Well, at least Michelle isn’t giving him pretzels. I did laugh and felt bad about it. They did it at McCain's funeral as well. It's a thing. Michelle Obama is part of the DC ruling class? I know people are probably gonna wanna be like "Hey Junior your dad wasn't THAT great a president" but I mean, that's his father he's talking about and they were on great terms. Of course he's going to speak highly of him (as he should). That was nice to listen to though. Most of it came across as government-official-giving-a-speech, until the very end as you noted. Bush Sr. probably does better than most post-WWII presidents, including some Democratic ones, if judged by the number of catastrophes they contributed to or caused while in office. Like I'm not entirely convinced that he was a worse president than Obama. "US President" sets a pretty low moral bar, so I'm not saying the tone of the thread is necessarily unjustified, but by that set of standards I'm hard pressed to see why he was so terrible. Highway of Death is probably the worst thing brought up in this thread, and that is terrible, but it pales in comparison to, say, the invasion of Iraq or the Vietnam War or arguably the destruction of the Libyan government. I always kinda wondered why he stopped where he did with Iraq. A strange war for a US president. My theory is that it's because he wasn't a dumbass. 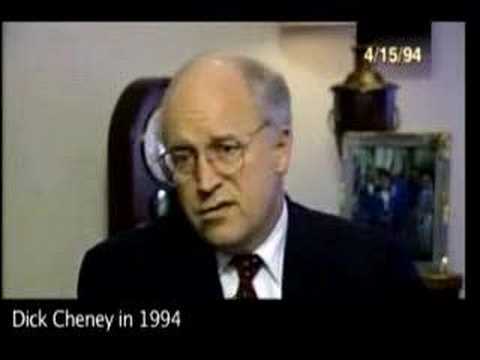 Cheney fairly accurately explained in 1994 why the 2003 invasion was an idiotic idea. Which becomes disturbing when one considers his role in the Bush jr. administration.